CB long blocks and turn key engines are assembled from all new parts. Partial engine break in has been accomplished by running the engine on the dyno prior to shipment. However, it’s advised to drive the engine conservatively for the first 1000 miles while keeping the RPM under 5500. Use premium fuel. Do not over rev a cold engine. Allow the engine time to warm to running temperature before exceeding 2500 RPM. Blipping the throttle on a cold engine can damage the rings, and bearings. The valves in new engines should be adjusted at the first 100 miles and thereafter at every 2000 miles. High performance VW engines are equipped with solid lifters and Chromoly push rods. The valves should be set at .002 lash with the engine cold. The valve covers must be removed prior to adjusting the valves. A basic valve adjusting procedure to follow is to set # 1 cylinder at TDC * and check the lash setting on the intake and exhaust valves on # 1 cylinder. .002 lash can be attained by loosening the adjusting screw lock nut on the exhaust valve, and turning the adjusting screw inward (clockwise) until the swivel foot fits firmly to the valve tip. Turn the adjusting screw out (counterclockwise) until you can rotate the push rod with your thumb and fore finger. Lock the adjusting screw nut, check the push rod to make certain that it rotates. The adjustment should be firm, no extra end play, and allow the push rod to be rotated. Repeat the adjusting sequence on the intake valve. Re-check both valves on the # 1 cylinder. Make certain the there is no extra end play and that the push rods can be rotated. Repeat the valve adjusting operation on # 2 cylinder, but first rotate the crankshaft 180 degrees to the left. 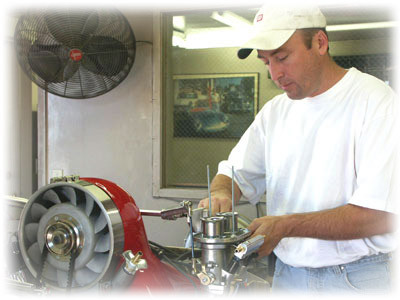 A ½ (180 degree) crank rotation to the left will position the # 2 cylinder at TDC. When the valves are adjusted on # 2 cylinder, rotate the crankshaft another 1/2 turn to the left and adjust the valves on # 3 cylinder. TDC on #4 cylinder is reached by rotating the crank another 180 degrees. The valve adjustment procedures are the same on each barrel. Replace the valve covers when all of the valves are adjusted. .002 lash becomes a safe margin as the engine warms. The increased temperature causes the barrels to grow more than the push rods and additional clearance is created in the valve train. Engine valves should be adjusted at every 2000 miles. Top dead center (TDC) can be located by rotating the crank to position the timing pulley at TDC. This will indicate that either number #1 or #3 piston is at top dead center. Remove the distributor cap and check the rotor to determine which spark plug terminal the rotor is pointing at. If the pulley is indicating TDC and the rotor is pointing to #1 terminal in the distributor cap, #1 cylinder is TDC. If the rotor is pointing to the number 3 terminal in the distributor cap, #3 piston is TDC. TDC on #1 cylinder can then be reached by rotating the crankshaft 1 full rotation to the left. The “up” or TDC cylinder can also be determined by rocking the crankshaft back and forth in a quarter rotation. Valves will move on every cylinder, except the one that is TDC. Engine oil should be changed at every 2000 miles. We recommend the use of Kendal GT1 40 wt. or Kendal GTI 20 – 50. The oil pick up screen located in the bottom of the engine should be removed and cleaned as part of every oil change. Make certain to re-fill the engine with oil prior to re-starting. Engines without accessory oil sumps require slightly less than 3 quarts of oil. CB engines are often equipped with accessory oil sumps that are available in 1 quart and 2 quart models. Your engine will require additional oil if it’s equipped with an accessory oil sump. Engines equipped with external oil coolers and filters will also require additional oil. The amount of additional oil is determined by the volume of oil in the external cooling and filtering system. Fill the crankcase to the full line on the dip stick. Disconnect the coil wire, crank the engine with the starter until the oil warning light goes out. Re-check the oil level, and if it’s at a safe level on the stick, connect the coil wire and start the engine. Observe the oil light, and gauge, make certain that the engine has oil pressure, and let it idle for about 1 minute. Turn the engine off and check the oil level, add oil if required. Repeat the oil check and look for any signs of oil leakage. Do not operate the engine without sufficient oil. Ignition timing should be set at 30 degrees BTDC at 3000 RPM. This is accomplished with a strobe light. The exact ignition timing at idle speed can vary. What is important is not to exceed 30 degrees BTDC at 3000 RPM. Idle speed RPM should be in the 900 – 1000 RPM range. The spark plugs recommended for use in 044 cylinder heads are NGK DP8EA-9. Please refer to the Weber Tech Handbook for information concerning maintenance and tuning of Weber carburetors. 1. Check the intake manifold nuts – 20 lbs torque – at valve adjustment time. 2. Keep the air filters clean and oiled. 3. Use only premium fuel.